I love doing these posts where I let you know about some of the expensive products that are the best of the best and that I really don’t mind spending my money on. 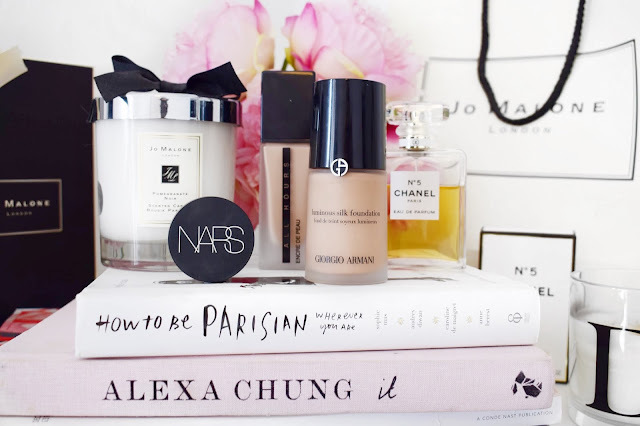 I am sure that if you have read my blog for quite a while, you will know that I am lover of all high-end makeup. I don’t know why, I just feel like high-end makeup seems to work so much better for my skin, probably because my skin is so incredibly awkward, and drugstore just cannot really seem to hold up to it. So, every now and again, I like to do these posts and let you know that expensive makeup items that I would recommend to everybody and that I repurchase time and time again. I do these posts quite regularly to keep you guys up to date on what I really think is worth the money. There are going to be many of my old favourites mentioned in this post, because I am a creature of habit and I like to stick to what I know, but there are also some newbies thrown into this post that I have been really loving and reaching for all of the time. As normal with all posts here on my blog, I wouldn’t suggest anything to you, if I didn’t really love it and believe in it. I can tell that this is going to turn into another really long post, so without any further rambling, I will jump into the post! I had to start out this post with this little baby. I have been wearing Chanel No5 almost daily for the past 10 years. It is just a perfume that I cannot seem to get away from. Over the years I have tried out so many other perfumes, but nothing really seems to compare to this and that is why I always go back to it and start to use it again. I first started my obsession with this perfume because my mum has always used it and I always thought it smelt to die for. Then when I hit my teenage years, this was what I asked for at Christmas and birthdays, and I got myself a nice little stock of Chanel No 5. I wear this perfume every single day and now people know just to associate this perfume with me. I know that it is an expensive perfume to have an obsession with, but I think that it is beautiful, and I continue to use it. I just think that this has such a luxurious smell and it just makes me feel better about myself from the moment I put this on. Plus, this is a really long wearing perfume on me and I feel like I can smell it all day long even when I apply the smallest amount. I would highly recommend going into a store and trying this out for yourself. I just always try and stock up on this when places like Boots or House of Fraser have discount days to get some money knocked off! This is one of my all-time favourite foundations and I am still just as in love with it now as I was when I first bought it. To start with, I didn’t think that this GiorgioArmani foundation was going to work for me. Normally the words luminous and oily skin, don’t go hand in hand which is why I stayed away from this to start with. In the end I bought it and fell in love with it, then the whole world suddenly decided that they wanted to try it because of Kim Kardashian and I couldn’t get my hands on it for the longest time, it wasn’t until the hype died down that I could finally get my hands on it again! 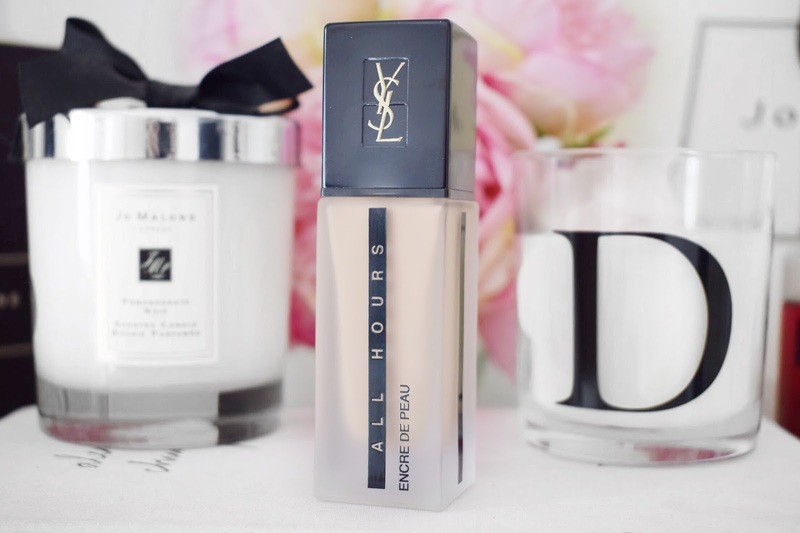 This foundation has such a stunning finish and I always love how my makeup turns out when I use this Giorgio Armani Luminous Silk Foundation. This foundation makes my skin look so pretty and like it is glowing from within. I don’t feel any oilier than usual when I wear this foundation and I think it holds up really well throughout the day when I go in and powder regularly. 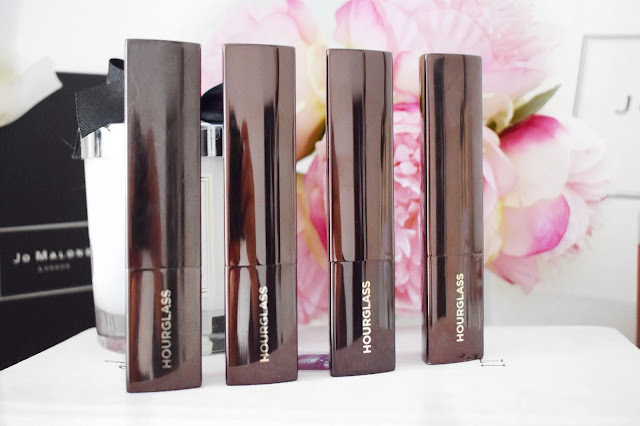 I do have foundations in my collection that are longer lasting on the skin than this foundation, but they don’t have the same stunning finish and that is why I continuously reach for this, especially when I am going out and I want my makeup to look perfect. We all know that I could speak about foundations all day and all night, so this is the second one out of three that I am going to mention in this post. I really don’t think that I could do this post without mentioning the Hourglass VanishFoundation Stick. I first bought this foundation as soon as it was released the other year and I can’t really admit that I loved to straight away. Mainly on my part because I bought the completely wrong shade and I looked like an Umpa Lumpa, but I used all of it because it was so expensive. It wasn’t until I bought my correct shade in Golden Tan, that I fell in love with this foundation and couldn’t seem to put it down. Now, this isn’t the kind of foundation that I usually mention here on my blog and that is because it isn’t really great for oily skin. But, I happily blot and re-powder this foundation throughout the day because of how stunning it is on the skin. I have never used a foundation that quite gives the finish that this one does, it is simply stunning. This foundation doesn’t have flashback, which makes it perfect for if you are having your photo taken because you won’t get a white cast. This is a super creamy and blendable foundation and it feels so soft when I am applying it and buffing it into my skin. I go through these things like they are going out of fashion, and I really do think they are worth it despite, the small amount of product and the high price tag. I had my eye on this palette for years before I went ahead and bought it. Even though I was desperate to get my hands on it, I hadn’t really seen any reviews on it before, and I don’t just jump into my Tom Ford purchases lightly. I know that some people tend to get their backs up whenever I mention anything Tom Ford, but I think that it is a great beauty brand that really deserves the high price tag. I reach for this palette constantly and it has quickly become one of my most used items in my vast collection of makeup. Not to mention that the packaging for this is just dreamy and I love reaching for it because it feels so luxe! The contouring shade in this is just perfection. I wouldn’t actually call it a contouring shade, to me this is more like a bronzing shade that helps to bring dimension back into the face after going in with my foundation and concealer. The highlighter in this palette, isn’t a stark bright highlighter that many people seem to like, it is more like a really pretty sheen that makes the skin glow. My favourite way to apply the bronzing/contouring shade is by laying down the product with my Tom Ford Shade and Illuminate brush and then pushing it into the skin using my damp Beauty Blender. Then, I like to apply the highlighter using my ring finger and just patting it in where I need it. This really is a truly stunning product and I am yet to find something that can top it! I really do not think that I could do this post without mentioning my trusty Nars Soft MatteConcealer. I know that I have been harping on about this concealer for near on two years at this point, but I think that it is such a stunning concealer. I know that I have said this before but, I first saw this on Carli Bybel’s YouTube channel. She used this in a tutorial well before it was released, and it drove me crazy because I had to try it out. Literally, the minute that this was uploaded onto Space NK website, I logged on and within minutes I had checked out with this lovely little concealer. When I first bought this, and tried it out for the first time I was hooked. This really was unlike anything that I had used before and it did stunning things to my makeup. What I in particular love about this concealer is that it makes my makeup, where I apply this product look so stunning and smooth. It gives the skin an almost airbrushed look and it even helps to hide the pores around my nose. What looks really good is when I use my Tarte Shape Tape underneath my eyes and then I use this in other areas, including around my nose to highlight and conceal. 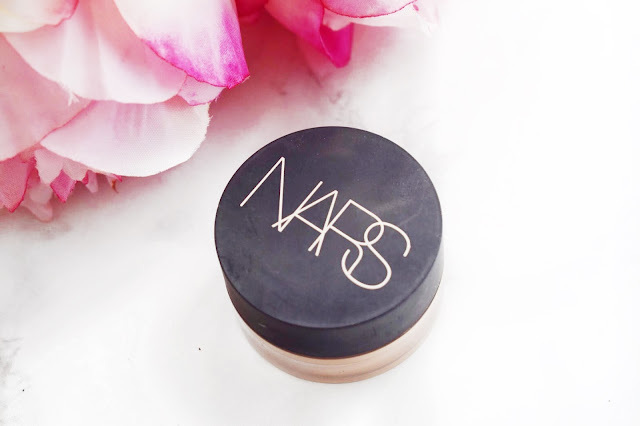 I really do not think that I am going to get bored of this Nars Soft Matte concealer any time soon! From the moment that Charlotte Tilbury started to show this on her Instagram, I knew that I had to get my hands on it. For such a long time, she was putting up teasers of this and showing the packaging and it was just speaking to me on a spiritual level. I really was set on buying this palette, well that was until I saw the price anyway. I expected this palette to be around £40, which I think would be a reasonable price for an eyeshadow palette with 12 shades in, similar to the ABH Modern Renaissance Palette, or the Urban Decay Naked Palettes. But, this went up on her website at £60 and I have to say that I was a little hesitant at first, but don’t get me wrong, I still went ahead and bought it because I have zero will-power! But, with that being said, I do really love this eyeshadow palette. If you have seen this palette before, you will know that it is broken into 4 different sections. I think that all of the shades in the palette are really stunning. I have now used every single shade and all of them are really highly pigmented and they blend out like a dream. I reach for this palette on a near enough daily basis and I always love how my eye makeup turns out. I even used this eyeshadow palette on the bridesmaids for my sisters and it created really natural, wearable but stunning makeup looks. I know that you are all probably bored of hearing about this product, but I think that it is stunning! 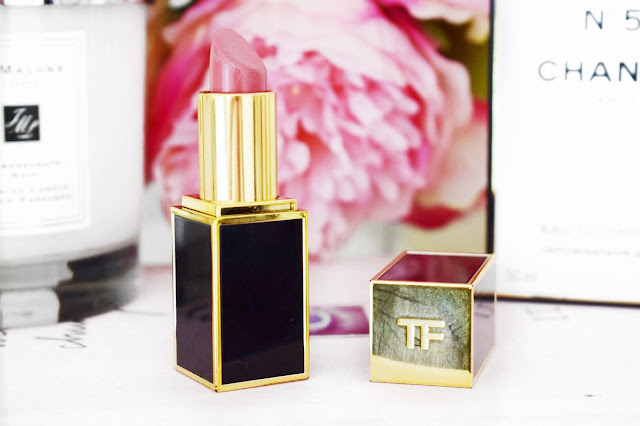 I know that I mention this Tom Ford Lipstick quite often, but I really do love it and that is the reason why I mention it time and time again. When I first thought about buying a Tom Ford lipstick, I talked myself out of it so many times. I just couldn’t bring myself to spend so much money on one single lipstick. Most of the foundations that I use are cheaper than this lipstick, which is why I was a little dubious about it. I wanted to make sure that I bought the most perfect shade, so I went into a store and played around with the lipsticks until I found my ideal colour which is India Rose. The main thing that I love about these lipsticks and why I continue to buy them despise the extortionate price is how they feel on the lips. I know that matte lipsticks and stains are a big thing at the moment, as they have been for years, but I am more of a fan of a satin finish and that is why I love these. Not only is the colour to die for, but it makes your lips look super healthy and nourished. I reach for this all of the time and it is the most perfect lipstick. I am on my third one of these and I don’t show any signs of slowing down with them. Plus, to say how lovely and nourishing these lipsticks are, they are also long-lasting, and those two things don’t usually go hand in hand! From the moment I saw this being mentioned all over the internet this time last year, I knew I had to try it out for myself. Most of my makeup recommendations come from my all-time favourite YouTuber Casey Holmes and from the moment she said she liked this, it went straight onto my wishlist. Because I have oily skin, usually it works out that anything that Casey uses, I tend to love. I bought this not long after she first mentioned it and I fell in love with it almost straight away. I have reached for this so much throughout this year and each and every time, my makeup looks flawless, regardless of what other makeup items I use. I know that some people have said that this does smell quite strong of alcohol and I admit that it does, and people don’t tend to use things on their skin that are high in alcohol, but I personally don’t have an issue with it. My skin isn’t particularly sensitive, so I can get away with wearing products like this one. This lasts so beautifully on my skin, all day long. I wouldn’t say that it is as long lasting as something like the Estee Lauder Double Wear, but it is up there with it. I found that this does help to control my oils and it has a nice medium to full coverage finish. I would highly recommend going into a store and getting a sample of this foundation because I have really been enjoying using it recently. I know that I am mentioning something else that is Tom Ford, please don’t shoot me. I know that this is a super expensive makeup brand, but I am completely in love with everything that I have tried out by the brand so far. When I first fell in with my Tom Ford Bronzer Brush, I knew that I wanted to try their bronzer out. I had seen it on the Tom Ford stand before and it looked really stunning, but I didn’t want to just jump into buying something so expensive on the basis of it being really pretty. So, I looked into some of the tutorials that were online for it and I decided that I just had to try it out for myself. I bought this from House of Fraser the other year and I haven’t looked back since. I reach for this bronzer more than I thought I would, which is good considering the price of it. For anybody that doesn’t know, I am a bronzer hoarder. When a brand comes out with a new one, I have to try it out almost immediately, so the fact that I reach for this one a lot over some of my other favourites really speaks for how much I love this. What I adore about this bronzer is the shade. It is such a stunning shade that really does make the sun look healthy and glowing and not like you are caked to the nines with bronzer. I reach for this pretty much every single day and this paired with my Tom Ford Bronzer Brush is just the ideal combination! So, there you have it, products that I think really are worth the splurge. I repurchase these products all of the time because I love them, and they seem to work wonders for my skin. As normal, I will leave links to everything that I have mentioned down below in case you want to check anything out. If you want to see my full review on any of the products that I have mentioned, just click the name of the item above to be taken to that page. Make sure that you leave me a comment down below and let me know some of the products that you think are worth the splurge! Oh yes, I need all of these! They are amazing, I love them all! I've been wanting to splurge on the Giorgio Armani Foundation but always questioned if it would be good for oily skin. It works fine for me, I do have to powder in an afternoon, but that is nothing new for me and my skin! It is such an amazing palette, I adore it! It took me so long to finally try Luminous Silk and it's one of the best foundations I've tried. Worth every penny. It is out of this world, it always looks so stunning! I have been eyeing that tom ford bronzer for ages! It looks absolutely Luxe! It really is a stunning bronzer! I couldn't recommend it any more! What a great post! 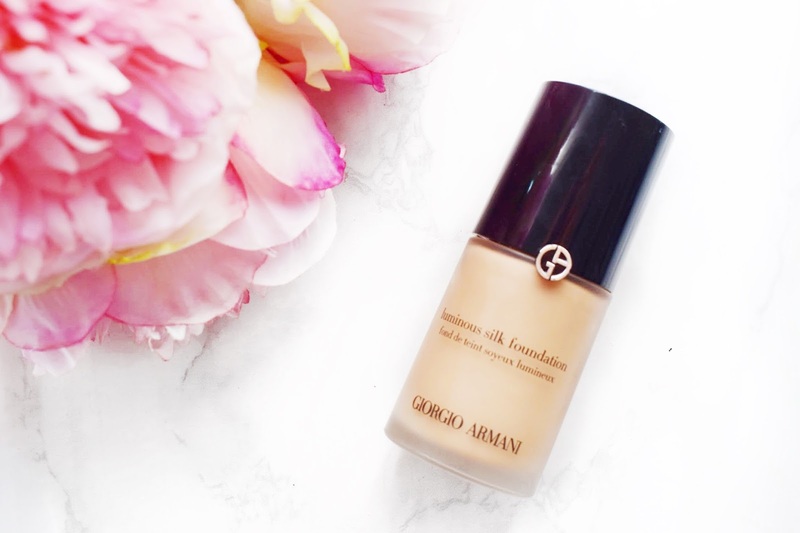 I really like the Giorgio Armani Foundation too! I have yet to try the Nars Concealer and That Ysl Foundation - two of the things I found out about in this post that I really want to try! Thanks for sharing! I hope you try them out sweetie, they are stunning! It makes my skin look unlike anything I have used before! I agree 100%, all these pretties are well worth the splurge, ESP Chanel No5 and Georgio Armani foundations. I really couldn't recommend it anymore!